“Automotive Seats Market: Global Industry Analysis (2012–2016) and Forecast (2017–2025)” is the new report published by Persistence Market Research for the assessed period of 8-years, i.e. 2017-2025. The passenger cars segment is expected to witness significant investments in technology over the projected period. The main objective of this 8-years report is to provide updates and market opportunities in global automotive seats market. We have analyzed the global automotive seats market to estimate and comprehend the overall scenario of the market. The report is categorized into six segments based on vehicle type, product type, cover material, technology, sales channel and region. It calculates the global automotive seats market in terms of value (US$ Mn). The report is mainly based on value chain and cost structure analysis. It starts with an executive summary of global automotive seats market. Our team have analyzed the key trends, drivers and restraints from the supply and demand acuity under this particular section of the report. This new publication has included automotive seats market definition to understand the entire process and its components for market analysis along with the product lifecycle of automotive seats. Furthermore, an estimation over market size and percentile share for various segments in the global automotive seats market is provided with the cost structure analysis. The market has been tracked from the supply side and the demand size has been considered to triangulate the approach. Macroeconomic indicators such as GDP, Automotive sector growth, global trade statistics automotive industry growth have been considered. Bottom-up approach has been used to assess market numbers for each product category, while top-down approach has been used to counter validate the market estimations. In the final segment of the report, the global automotive seats market landscape is encompassed to provide report viewers with a dashboard outlook, based on classifications of providers through the value chain, presence in an automotive seats product portfolio and key differentiators. To compute the market size, the report analyses total automotive seats production and sales in global market. The figures are validated by accessing the supply side and estimated the revenue created from automotive seats products. It is further authenticated through secondary research, and qualitative inputs from primary respondents are incorporated to arrive at the appropriate market size. The number of OEMs, Tier I, II and III players across globe are tracked and their revenue from automotive seats is estimated. When developing the market estimation, current market sizing has been done at the initial stage that forms the foundation to calculate the market size for the next eight years. Based on the aspects of the market, we reached the conclusion depending upon various analysis results based on the supply side and demand side. However, quantifying the market across the above-mentioned segments and regions is more a matter of quantifying expectations and identifying opportunities rather than explaining to them after the forecast has been completed. Another key feature of this report is the thorough analysis of the global automotive market and its revenue forecast in terms of the absolute dollar. This is traditionally unnoticed while forecasting the market. However, absolute dollar opportunity is critical in evaluating the opportunities that a provider can look to achieve, as well as to classify potential resources from a sales viewpoint in the global automotive seats market. Need: The vehicle interior air quality (VIAQ) can be adversely affected by emissions from the vehicle trim components (polyurethane and PVC foams, carpets, adhesives, etc.). This could severely impact the health and comfort of the drivers and passengers. Owing to these concerns, participants in the automotive industry are giving high importance to VIAQ, primarily due to the market image but ever more due to the increase in industry regulations. In the recent past, regulatory bodies have begun implementing regulations that is mandating the reduction of VOC emissions in the vehicle interiors. Regulations: Directive 2004/42/EC of the European Parliament and of the Council of 21 April 2004 on the limitation of emissions of VOCs due to the use of organic solvents in certain paints and varnishes and vehicle refinishing products and amending Directive 1999/13/EC. Korea was one of the first countries to establish whole vehicle VIAQ requirements with the 2007 publication of its “Newly Manufactured Vehicle Indoor Air Quality Management Standard,” Notification No. 2007-539, issued by Korea’s Ministry of Land, Infrastructure and Transportation. Description: Chemicals affecting the vehicle interior air-quality can be attributed to a variety of different sources that typically include interior components and finishes employed for structural or safety purposes or for aesthetic effect, which are made of a wide variety of materials such as leather, fabrics, hard plastics, elastomers, rubber, fibers and resins. However, there are also a number of external factors that determines the actual chemical concentrations in vehicle interiors such as humidity, heat, and user habits such as smoking inside the vehicle compartment. Emission of VOCs from interior parts are one of the principal contributors to VIAQ-related issues in both new and used vehicles. These are often part of the chemical composition of materials and components used in vehicle interiors, but can also be found in material adhesives as well as in cleaning materials and compounds used in preparing and maintaining vehicle interior surfaces. Effect on automotive interior materials: Owing to the number of regulations related to VIAQ, there is an increasing demand for use of environment-friendly materials in the interior of the vehicles. Major manufacturers are shifting focus towards marketing of interior materials with low VOC content so as to comply with regulations. 2017 end, expanding at a CAGR of 4.1% over the forecast period of 2017-2025. Increasing demand for hybrid and electric vehicles in the region is the primary reason for fueling the growth of automotive seats market in APAC. 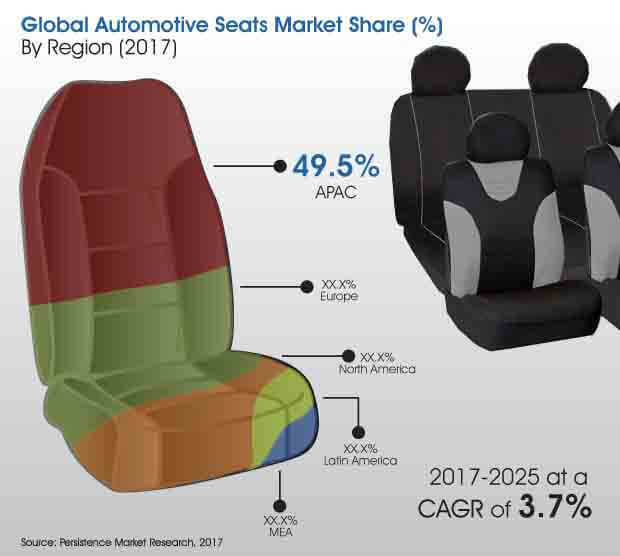 Europe market is estimated to grow in the global automotive seats market with more than 20% market value share, valued at more than US$ 12 Bn by 2017 end; expanding at a CAGR of 3.5% over the forecast period of 2017-2025. Global sales of automotive seats is estimated to be valued at more than US$ 55 Bn in 2017 and is projected to increase at a CAGR of 3.7% over the forecast period to be valued at little more than US$ 74 Bn by 2025. In terms of volume, the global automotive Seats market stood at 320,674 ‘000 Units in 2017 and is expected to reach 407,862 ‘000 Units by 2025 end. The market is slated to expand at a CAGR of 3.1% during 2017-2025 in terms of volume over the forecast period. Camaco LLC, Amvian Automotive (Pvt.) Ltd.